In the Footsteps of Christ! Witnessing the Catholic Faith, loyalty to the Pope and to the Magisterium of the Church. 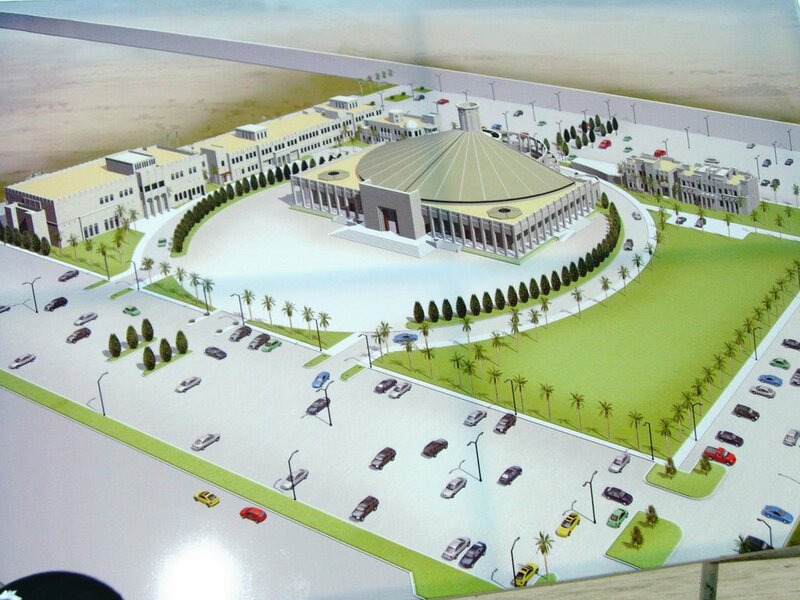 This is the design of the new Our Lady of the Rosary Parish Church here in Doha, Qatar. The church here is run by the Franciscan Missionaries from India and the Philippines. The new parish accomodates all the Catholic Rites that are present here in Doha. We have here a Maronite Catholics, Syro-Malabarese Rite Catholics and the Roman Rite Catholics all belongs to this parish. It is of joy that all the Rites of the Catholic Church is being celebrated here in these new Parish and what a great work of the Holy Spirit indeed. I was able for the first time to observe the Maronite Rite of the Holy Mass being celebrated and the Syro-Malabarese rite and it is very much a new experience of being a true catholic in the sense of the word because of the different traditions of the Church I have encountered here and it is the same though different in it's cultural orientations. Praise the Lord for the presence of the Church here in this part of the world. Pray that all the faithful here be a light and a beacon of the Gospel of love and peace. This entry was posted on Wednesday, November 15, 2006 at Wednesday, November 15, 2006 . You can follow any responses to this entry through the comments feed . this is so awesome. I hope in the near future you can include photos of the church. Glad you stopped by our board! p4p said...this is so awesome. I hope in the near future you can include photos of the church. Yes I will do it but as of now the construction is on going and no one is allowed to enter the site except the Parish Priest and the construction people for security reasons. But a few description for your information. As of now the foundations and pillars are being constructed but we are still continuing to give in as much as we can give to finance it's continued construction. And I know God would provide for it we trust in His Divine Providence. We need your continued prayers for these great work here. Thanks in advance! Is there a way for Catholics to support this parish financially? Please let me know, if there is. We will pray for the presence of Our Lord and the intercession of Our Lady on your behalf! Wonderful to see a blog for the Doha parish. Many blessings to you. Hi! I'm Heisan Salivio and this is a blog that I have created to share something that I learn about blogging since I started in 2005.I created this blog to earn extra money hopefully and at the same time share what I've learn from blogging since 2005. Welcome! Hope you'll enjoy and learn something from my post here. I'm a Catholic layman who once opted to become a priest but later choose to marry rather than be an impure one. A great admirer of St. Augustine and St. Paul and an avid Papist.I am blogging since 2005 and created at least three blogs. One is all about technology, second is about my faith and journey as a Catholic and third is about blogging reviews and monetizing a blog. I am a medical professional but have been hooked in the internet learning to make a web page using CSS and HTML which I am an amateur as of now and still continually learning. Information on religious freedom in Qatar! Short Info on the Church present in Doha, Qatar!